With the 32nd annual Vancouver Playhouse International Wines Festival just around the corner, April 1th to 25th, I had the opportunity to attend a media preview of two of the regional theme partners ~ Argentina and New Zealand and taste over 70 wines from both nations. At the preview tasting hosted by the Shore Club I was extremely impressed by Argentina’s aromatic whites from the native Torrontes varietal (think Gewurztraminer, Riesling, and Viognier) and not surprised by the quality and complexity of many of her Malbecs. Argentina maybe the hot blooded land of the Tango and Paso Dobo but a combination of latitude and high altitude “cool macro and micro climates” the vineyards create wines of excellent ripe fruit forward style but balanced by crisp acidity. While working your way through the tasting room in April look out for the Luigi Bosa Finca La Linda Torrontes 2009 – one of my preview favourites. Straw green with intense lychee like aromas of rose and flowers. Medium-bodied, richly textured with crisp balancing acidity, and complex flavours of nutmeg, peach, lychee, and ripe pear. Excellent value! An iconic Malbec to try will be the Graffigna Reserve Malbec 2006; aged 12 months in equal amounts of French and American it is Ruby red in colour with aromas of cedar, chocolate and plum. On the palate it is full-bodied, lush, and loaded with lovely flavours of black plum, chocolate, and warm exotic spice (cinnamon and clove). Outside of the world’s fascination with Malbec some great blends are being conceived. The Masi Tupungato Corbec 2007 is such a beast. 70% Corvina (Veneto Italy varietal) and 30% Malbec under going appassimento for 22 days along with 18 months in medium toasted French barrique. This dense ruby-red coloured blend has complex aromas of ripe sweet mulberry and blueberry and on its full-bodied and round palate notes of cherry kirsch, chocolate, and subtle leafy herbs dominate. Tasty and fascinating. Also search out the Vina Cobos Bramare Cabernet Sauvignon Lujan de Cuyo 2007 this 100% hand harvested Cabernet Sau vignon is wild yeast fermented and aged 18 months in a combination of American and French oak (37% new). It is ruby red in colour with complex aromas of milk chocolate and cedar resin. Full-bodied with some lush tannins, and flavours of cherry, cedar, and pipe tobacco. New Zealand home of Sauvignon Blanc and increasingly great cool climate Pinot Noir is a nice antipodean bridge to Argentina at this year’s wine festival. A Sauvignon Blanc that caught my attention included the unusual Mt. Riley Savee 2008 Sparkling Sauvignon Blanc. This 100% Marlbourough Sauvignon Blanc under goes traditional bottle fermentation to produce a supercharged fizzy SB. It is pale straw in colour with decent sized bubbles and pungent aromas of passion fruit, capsicum , and wild black currants. 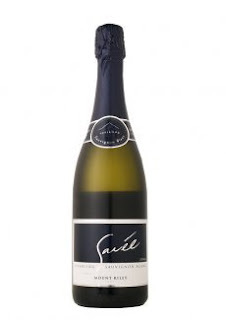 The bubbly is medium-bodied and crisp with gooseberry, nectarine, and typical but subdued capsicum hints. A tasty match for steamed Chinese seafood or Japanese uni. At the preview tasting I had opportunity to taste flights of Pinot Noir from the 06 through 08 vintages. The 07 vintage showed very well. Seek out the 2007 Gibbston Highgate Soultaker Central Otago Pinot Noir, a cold soaked and French oak aged Pinot with complex Burgundian aspirations but full-bodied with smoke, earth, wild aromatic herbs, and cherry like flavours. Beautifully crafted PN. Also try the Spy Valley Marlborough Envoy Pinot Noir 2007 with its wild yeast fermentation and 18 months of French barrique ageing was a dynamite drop with layers of earth, forest wood smoke, and Burgundian styling wrapped around its full-bodied structure and style. Look for Spy Valley on the tasting room floor! Away from Sauvignon Blanc and Pinot Noir check out the Bordeaux blends from the North island. The Paritua “Red” 2007 Hawkes Bay Cabernet-Merlot was a great find. This four varietal blend, mainly Cabernet ~ Merlo t, and a 99 barrique run is ruby red in colour with new oak and cedar resin aromas. On the palate it is full-bodied with lush round tannins (3-5 years ageing potential) and lovely flavours of blackcurrant leaf, olive, ripe cherry, spice, and intriguing herbal notes.